For the majority of us, the mountain bike race season runs from April to September with peak races falling between Memorial Day and Labor Day. October and November are our “off-season” months before base training ramps up for the following race season. Even if your timing does not fit the classical scenario it is still a good idea to put a 4-8 week off-season period into your schedule once per year. The off-season is a break in routine and a chance to improve in areas you might be missing. Here are 10 things you can do in your mountain bike off-season to be faster next year. The first task of your off-season is to rest, recover, and restore both physically and mentally. Everyone ends the season with different amounts of energy and motivation. If you are sick of the sight of your bike and riding feels like a chore, put it away for a few weeks. Go hike or paddleboard or whatever you are in the mood for. Most of us however love riding and don’t want to stop. As BikeSnob NYC jokes “It’s okay to be turned on by cycling all year round”. Continue to ride if your motivation is high but drop your weekly ride volume by 50 percent for a few weeks to ensure you unload the accumulated fatigue from a full season of racing. Changing the nature of your riding can be restorative during the off-season. A change can be as good as a rest. Take advantage of your ride time without intervals or training structure to play and build new skills. Session some rocks with your friends. Switch to a different style of bike. Maybe go dirt jumping, do some lift served riding or try single-speeding. Keep it on 2 wheels but burn some gas instead of carbohydrates and head out on a moto. 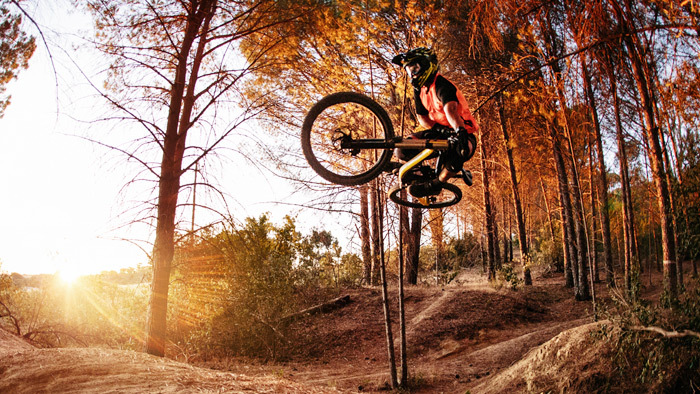 Learn how to ride a wheelie, do a track stand, or clean tight switchbacks. Any new skills you build will make you a more accomplished rider which will translate over to race speed. Change it up and keep it fresh. Even though we pedal 50 to 100 revolutions per minute, pedaling efficiency is an often overlooked area to reap gains. Tiny improvements in pedaling skill and efficiency adds up to greater speed. An economical cyclist is one who rides with little wasted energy. Get faster without getting fitter by improving your pedaling economy with a variety of pedaling drills. Do high cadence drills to work on the top end of your pedaling speed. Focus on being smooth while transitioning in and out of the saddle and increase your efficiency while pedaling out of the saddle. Notice any holes in your cadence range and work to fill them. Improving your wrenching skills will absolutely make you a faster racer. Learn how to fix everything on your bike and a mid-race mechanical will likely be a hiccup in your day rather than a race-ender. Your bike is probably in bad shape after a season of racing. Overhauling it is a perfect way to start your off-season wrenching apprenticeship. Anything you need to learn about bike mechanics can be found on YouTube. Take a class or download an app such as Headspace and learn how to meditate. Meditating will reduce your overall stress level and increase well-being. It is a useful technique to control your pre-race emotions and arousal level so you hit the start-line in the ideal frame of mind to perform optimally. Meditation is one of the best ways to fight insomnia and increase sleep quality. Better sleep means faster recovery, higher quality training and premium performance levels achieved. Take the time to learn how to improve your sleep quality by tracking it with an app such as SleepCycle. Learn what improves your sleep quality and what undermines it. Use these lessons to get great sleep and enhance recovery patterns during the race season when it is crucial. Get your annual physical done with a panel of bloodwork to save as a baseline comparison should you run into any issues later in the season. Follow up with any lingering health issues such as elective surgery, tests or dental work you postponed during the race season. Sports drinks, gels, and chews are notoriously hard on your teeth. Taking care of these items now will reduce in-season training interruptions which can slow you down in race season. Rehab any lingering injuries or muscle imbalances you ended the season with. Visit a physical therapist for a rehab plan and get to work on healing your issues while your training volume is low. When physical training demands are low it is easier to run a daily calorie deficit and drop some body weight. If you are more than 10 pounds over your optimum race weight for men or 7 pounds for women, use the off-season to lose some fat. This will make you a faster mountain bike racer next season. Don’t fall into the cycle of gaining weight in the off-season as it will set you back. What held you back this season? Did you get passed on descents? Was it the short power moves that drained you? Did you have to take time off to heal tendonitis or another overuse injury? Figure out what your major weakness is, research how to eliminate it and spend four weeks really working on it. The likelihood is you will need more than four weeks to entirely dispense with a weakness but a four week focused period will kick start you on your way. The off-season is a great time to ride demo bikes or other people’s bikes and upgrade your own equipment. It’s the best time of year to pick up new gadgets like a power meter and learn how to use them before serious training kicks in. Riding a new bike in a new position can take time to adapt to. Use this lower volume riding period to ease into bike changes. Your support crew makes you faster by being there for you with moral and logistical support not just at races but especially during training. Don’t take that for granted. Use the off-season to pay-it-back and pay-it-forward. Spoil your support crew! You know what they like. Invest your time and energy in them and let them know they are a valued part of your team. Take advantage of an off-season period to add skills, inject variety, take care of chores and pamper your support crew. There is always something you can do to push your mountain bike racing up to the next level. Most of all have fun with your off-season to start the next season rejuvenated and ready to rock.